It was a coup for Buzzfeed to unmask the wicked compounding pharmacy that has been supplying Missouri Department of Corrections with pentobarbital for executions – but to my mind, the real story is the hypocrisy of being so clandestine about the tools, if you have decided it’s OK to execute people. After years of sleuthing, Buzzfeed revealed that the supplier, code name M7, that has been selling Missouri pentobarbital for executions, is actually a compounding pharmacy named Foundation Care – a company that has been deemed High risk by the FDA and accused of multiple violations, including lax procedures resulting in contaminated drugs; illegally reselling medications returned by patients; intimidating and demeaning behavior toward female employees and has paid settlement with Kansas over allegations of Medicaid fraud, notes the Buzzfeed article. The whole purchasing thing was done in very secretive style, to leave no paper trail, with a senior member of the Corrections department going to a secret rendezvous with envelopes “full of cash” to exchange for phials of pentobarbital. Unlike many other states who have been cutting back, Missouri has increased the number of executions to a furious pace. They have been topping criminals at the rate of one a month, with a total of 17 notes the report. 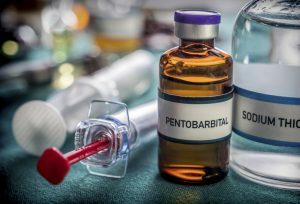 There has been much in the news about how states trying to implement the death penalty are having trouble getting the drugs to do it – despite the fact that they use a combination of very basic drugs that have been around for decades – pentobarbital (a barbiturate that has been used since the 1930’s), pancuronium (that paralyzing derivative of south American arrow poison) and potassium chloride (which most people take to counteract the potassium wasting effects of diuretic water pills taken for fluid retention or high blood pressure). When I was working as an anesthesiologist (or anesthetist, as I was then, as it was in England – but you know the American rule, never use a short word if there’s a long one you can use instead) these drugs were all very hum-drum, in every day use. Another interesting side issue from this business is how much Missouri was paying for the drug. As I say, pentobarbital has been around for decades. So why was Missouri paying $7,178.88 for 4 phials? This is of course quite in line with the whole predatory pricing practices of the pharmaceutical industry, which has nothing to do with the cost of the product. Just how well you’ve cornered the market. But what I really wonder about is the coyness. The secrecy. 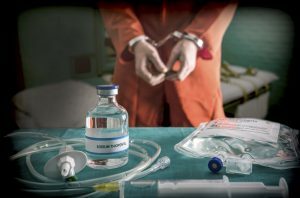 If Missouri has decided that the extreme punishment of executing people is the right way to go, why does providing the wherewithal have to be so clandestine?